Nokia Asha 501 is the first of the next generation of the Nokia Asha line, designed to bring highend user experience to low cost smartphones. The single-SIM version of the Nokia Asha 501 is now available in Nigeria. You can buy Nokia Asha 501 online at reliable online stores in Nigeria or at Nokia Stores. Nokia Asha 501 brings premium user experience formally exclusive for Nokia’s highend devices like the Nokia Lumia line and the Meego based Nokia N9 to low cost smartphones. Nokia Asha 501 features the new Nokia Asha software platform, which is a result of Nokia’s acquisition of Smarterphone in 2012. The Nokia Asha 501 supports swipe gestures, which is quite fast and cool for switching between apps and tasks. Its fastlane feature keeps track of your recently opened apps and tasks, which when combined with the swipe motion makes multi-tasking easy and fast on next generation Asha phones. It features 3.0-inch capacitive touch display with 240 x 320 pixels resolution and scratch resistant glass protection. On the rear-side is a 3.2 megapixels camera with QVGA video recording. Nokia Asha 501 offers only GPRS/EDGE data, but will Nokia Xpress browser will offer fast browsing and low data cost. Wi-Fi is available if you need fast browsing. 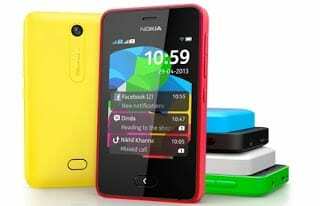 Nokia Asha 501 is available in Bright Red, Bright Green, Cyan, Yellow, White, and Black colours (all colours may not be available in Nigeria) and comes with 4GB built-in storage with support for up to 32GB memory card capacity. You can now buy Nokia Asha 501 online or at a Nokia stores. If you are wondering the features of this smartphone, read our Nokia Asha 501 article. Nokia Asha 501 Price in Nigeria currently ranges from N17,000 to N19,500.